I try not to be too party political on this blog, but it will hardly have escaped notice that I am the Green Party's Economics Speaker and that I have been selected as the top candidate for the south-west for next year's European Elections. So I will be seeking votes during this year, although I hope this will not affect the focus of the blog too heavily.The reason I stand for election is because I would trust myself to make the right decisions for the right reasons more than a member of any of the other parties. Unless you have decided that democracy is so corrupt that it is best avoided, a position I think has been created and is being reinforced by the corporate lobby, then you will end up having to make a choice next year and the following year. Which brings me to the purpose of this blog: to express my utter disgust at the prospect of the fracking industry turning into some sort of Wild West boom in our pleasant countryside as it has in the US, and to explore how the other parties are reacting to the possibility of fracking. The evidence is that all three parties that make up the corrupt political establishment are supportive of this new, dirty and expensive fossil fuel. In their world, where economic growth is the holy grail and profit is king, bizniz must chase after this next opportunity to make money and we must bear the cost in our communities. I am starting from my backyard because it is the part of the world I feel responsible for protecting. I grew up in Bath and brought up my own children in Blagdon, in the Mendips, so I found to my horror that licences have been granted all round that area, seeking to exploit the gas reserves in what was once the Somerset coalfield. The local campaign group Frack Free Somerset have provided a map of the licenced areas and also a list of suggested actions you can take. The economics of fracking demonstrate the extractive and exploitative approach to everything of value typical of capitalism. Licences to what are natural resources, and therefore in my book a common heritage, are auctioned by the Department of Energy and Climate Change. The prices look absurdly cheap to me, which probably explains the glee with which the energy industrialists are pushing forward with fracking. Cuadrilla's licence to destroy the Forest of Bowland in Lancashire cost just £160m. for an area of 450 square miles between Blackpool and Preston. There are tax breaks too: Britain will have the lowest tax rate for the fracking industry anywhere in the world, with a tax break called the 'shale gas allowance' more than halving the tax payable from 62% to 30%. This is one of Osborne's wheezes to make the economy boom in the run-up to the 2015 general election, and our local environments will bear the cost. With their friends and relatives in the oil industry and advisor Lynton Crosbie also having strong links to the oil and gas industry we should not be surprised that the Tories are supporting fracking. What about their partners the Liberal Democrats, those well known supporters of all things enviromental? When he spoke at the end of the last parliamentary session, Treasury Secretary Danny Alexander could hardly contain his excitement at the prospect of so much money to be made. It was Alexander who announced the bribes for local communities, which are in fact paltry compared to the profits to be made. For a mere £100,000 and 'at least 1 per cent' of overall revenues undefined 'communities' are lured into selling the birthright of their grandchildren. Unsurprisingly, where profits are concerned it turns out that it is not we who are the 99%. As befits a party seeking election within the next 18 months, Labour has been less sanguine about the prospects for such an unpopular and exploitative industry. Back in June 2011 Labour's energy spokesman Huw Irranca Davies called for a temporary moratorium while a review on safety was undertaken. His replacement as shadow energy minister, Tom Greatrex, continues the line of the need for better regulation rather than opposition to fracking in principle. In an interview with Business Green he argues explicitly that 'an absolutist position' is not in our interest, so we cannot expect opposition to fracking from Labour, whose opposition is avowedly conditional. Aside from the planetary pollution there is also the certainty of more local environmental pollution. Fracking is a vile industrial process that uses toxic chemicals that will contaminate our land and our water supplies. It is entirely inappropriate in our small island. It will set back the attempts to reduce our climate-damaging carbon emissions, which were already failing due to inconsistency and attempts to revive the economy through boosting energy-intensive consumption. But it also provides a way of avoiding the fundamental changes to our lifestyles and industrial processes that we know are ultimately necessary. To support fracking is like a parent encouraging their child to eat more sweets and drink more fizzy drinks while at the same time telling them that they need to lose weight. So, you know where I am going, and I at least have the excuse of having made this clear from the start. If you really want a party that will oppose fracking as part of a consistent policy to reduce energy use and undertake a transition to a fossil-free future you know what to do. 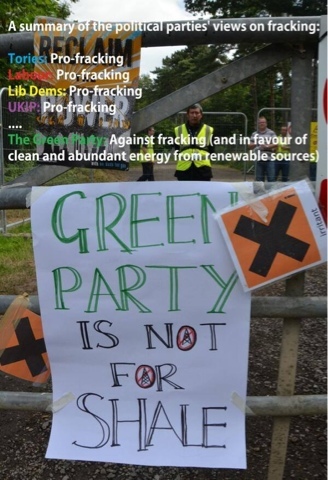 The Green Party stands against fracking. Caroline Lucas's rousing speech this past weekend at Balcombe makes the arguments clear, but in case you think we are jumping on a bandwaggon you can also watch her demolish the greedy pro-frack apologist on Newsnight in March 2012, while successfully putting Paxman in his place. As she argues, fracking will divert effort and investment from the expansion of renewables that is so urgently needed. It is dirty and dangerous to our health: we must stand together to oppose it. Very good points. I agree whole heartedly.